MIT, the Massachusetts Institute of Technology, is an academic institute combining a university with a technological facility. Located in Cambridge, Massachusetts, MIT is widely regarded as one of the world’s best university, and a leading institute in the fields of teaching technological subjects, and training hi-tech specialists. 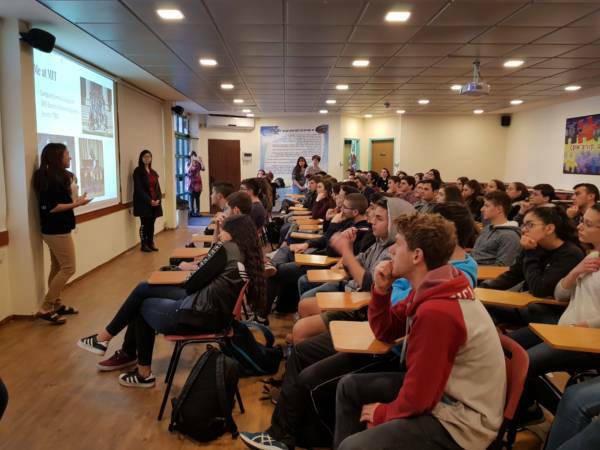 Recently, eight students from MIT – most of them majoring in technology and math, all of them women – arrived in Israel to conduct a workshop on entrepreneurship to students participating in ISTEAM Project, developed by Sci Tech Israel and currently being introduced in the network’s schools. The entrepreneurship workshop revolves around the App Inventor application, co-designed by MIT, Google, and other partners. The workshop itself was the culmination of a long preparation process, conducted through online Skype conferences between the MIT students and Sci Tech’s teaching staff and students. The students intend to spend about a month in Israel, during which they will get involved with nine Sci Tech Schools: Sci Tech Ronson in Ashkelon; Sci Tech Melton in Bat Yam; Sci Tech Modi’in; Sci Tech Guttman in Netanya; Sci Tech Spanian in Jerusalem; Sci Tech Greenberg in Kiryat-Tivon; Sci Tech Alon in Yoqneam; Sci Tech Kiryat-Bialik; and Sci Tech Achva Gilboa. 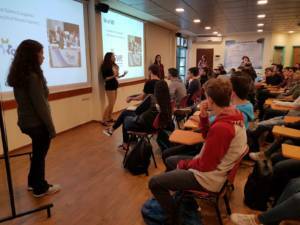 In each school, they will stay about five days, and during this time they will teach the students about the application and about other entrepreneurship tools, conduct ISTEAM-style activities, observe the local students’ projects and provide feedback. All the activities in this programme are conducted in English.